My friend told me that I may see those changes on the Nov credit card statement. 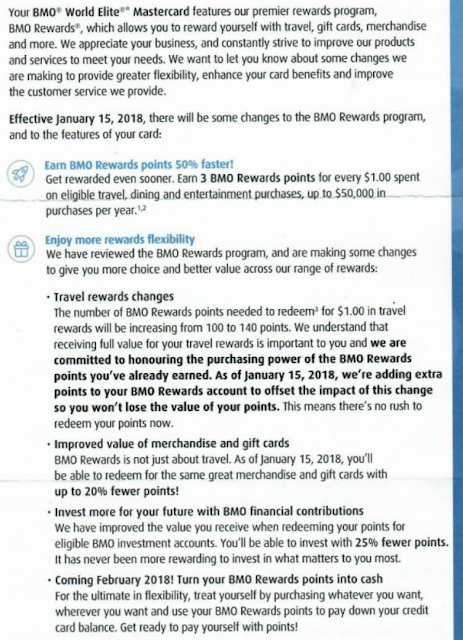 There is a bad news for BMO Rewards WEMC: the number of points needed to redeem for $1 in travel rewards will increase from 100 to 135 BMO rewards points, effective Jan 15, 2018! This makes the return ratio decreased from 2% to 1.48%, which is even lower than the current BMO Cashback WEMC (1.5%)... The points value for gift cards/merchandise/financial contribution redemption will be improved by up to 25% (but I am not interested in those items...). I think I may move to RBC WestJet WEMC or MBNA Alaska WEMC after Jan 2018. 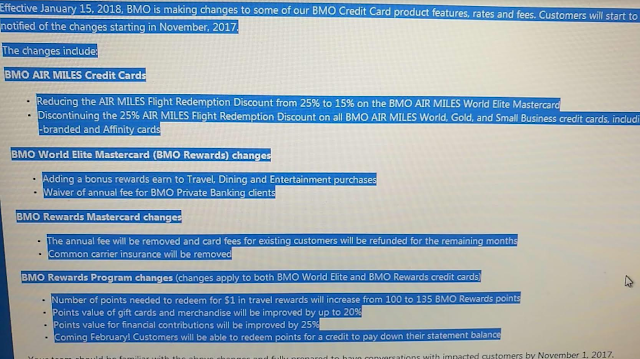 BTW, BMO will also make some changes to their everyday bank plan fees, effective Dec 1, 2017. Updated on Oct 24, 2017: Just FYI, I am not a fan of fake news, and I do NOT make fake news. I did not get paid for this post, and I did not pay any other people for the information. I just posted what I heard from my friends. Up to now, I still 100% believe that these BMO changes will happen soon. Updated on Oct 26, 2017: Just FYI, some updates from RFD.